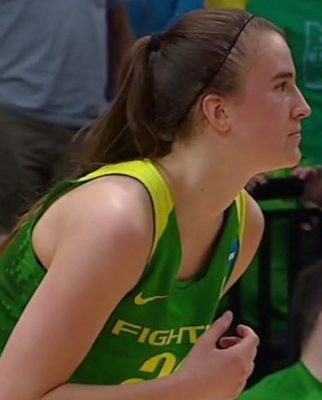 Sabrina Ionescu embodies everything that is right with college sports: she’s unselfish, a leader, good in the classroom, team first … the list goes on and on. 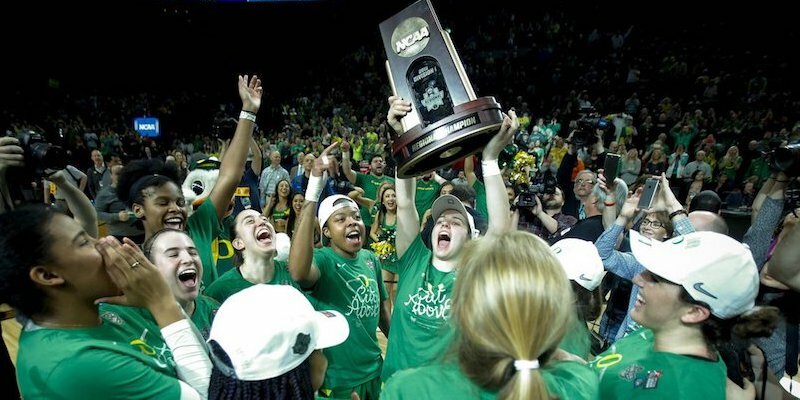 She put on a display for the ages with her 31 points, 7 rebounds and 8 assists in Oregon’s win that sent them to their first Final Four. They’ll play in Tampa on Friday against the winner of Baylor and Iowa. Oregon’s strategy was obvious and they stayed with it most of the game: Make Mississippi State’s All-American Teaira McCowan defend the pick and roll over and over. On one possession Oregon ran the pick and roll three straight times and the Bulldogs defended it beautifully. Then Oregon ran it the fourth time. On the first three McCowan hedged strongly, by stepping out on Ionescu and then sliding back to defend the lane. Each time Ionescu was forced backward toward center court. But Oregon stayed with it and ran it again. This time, McCowan wasn’t quick enough with her feet, Ionescu floated it behind McCowan’s back to Ruthy Hebard, and boom, layup. That’s great coaching, sticking with it, and having players who see the nuances each time and adjust on the next play together. Patience? Ionescu was flying around, shooting quickly, and setting up her teammates on every offensive trip, it seemed. But there was more. Did you see her stop in the middle of the lane those few times and just jump stop, wait, pivot, pivot, and find a cutter like Sabally for a layup, or kick it out to Maite Cazorla for that huge three to put them up by five late? Her ability to stay cool, let the play develop, and then make the correct pass, pivot to a better angle or shot, and just let her teammates run into space and hit them in the right spot, has WNBA scouts drooling. Most players panic in that spot, even the best of them. Not Ionescu. Ionescu can hurt an opponent in about 10 ways. She can shoot off the dribble, she can dribble drive and break down the defense. She can get into the middle of it and draw a foul, score, pass to an open teammate, or just disrupt the defense itself and shoot the mid-range. She can hit the three off a screen, off the dribble, or as a step-back shot. Her shot off the dribble is a floater in the lane, but when she goes baseline she often jump stops. Two quick dribbles to get the defender going back and then she stops in her tracks and goes straight up. She does this going left or right, and the quickness of the whole thing makes it very, very tough to defend. You ever try to jump up while moving backward? Despite all of that, making the shot after setting yourself that quickly is what makes it special. As a passer she’s adept at using either hand to hit the shooter right in the shooting pocket. That’s just above the waist on the shooting hand side, so someone can just catch, jump, and shoot. Satou Sabally was a difference-maker too. She is the only one of the three who can dominate inside or outside. Her outside shooting forced defenders to come up, and she smartly drove into the lane, put pressure on the Bulldogs, scored and drew fouls. Those things kept the defense from focusing solely on Ionescu. With only one player guarding her at a time, Ionescu could create for herself, Hebard in the paint, and as we saw at critical moment late in the game, Cazorla on the wing for three-point shots. Sabally is a match-up nightmare for teams when she has her outside shot going. Fluid, long, quick first step and she can score over smaller players and muscle up against forwards and centers. The Ducks are terrific when Ionescu plays well. They are great when Ionescu and Hebard play well together. And when Sabally joins in, they can play with anyone. 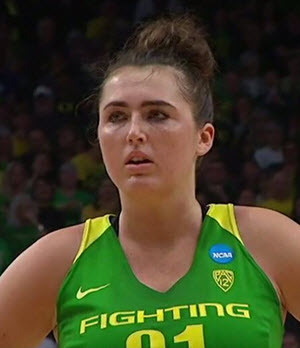 Oregon needs more offense out of Erin Boley if they’re going to win it all. 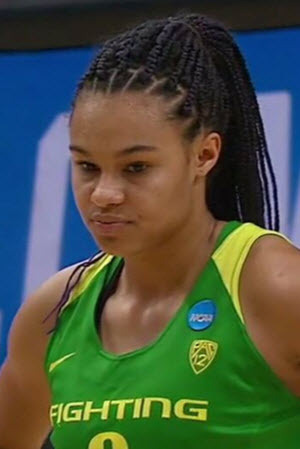 She went 2-6 from three, including an airball and some other good looks that the Ducks got nothing out of. Those are normal percentages for most players, but she’s not a normal player and they’re not playing normal games anymore. It looks like she’s not getting her feet set and she’s not staying with the follow-through all the way to the end of her shot. Boley hit one from the wing to start the fourth quarter as she held her hand up there until it went through the net. That form looked terrific. Some of her other shots, not so much. She’s releasing it really quickly. Sometimes it looks like she barely has control before she lets it go. Here’s hoping she has a chance to go shoot 200 jumpers a day to get her rhythm back. Oregon’s starters scored 86 of their 88 points. Just two points off the bench, a layup by Oti Gildon. Yikes. Oregon needs someone to come off the bench score a few buckets at some point. Taylor Chavez says she’s ready. The stage might be too big right now to bring her back for the first time in weeks, but it would be good to get some help from someone. I think Gildon could get them six to eight points and more rebounds each game. Sabally, Cazorla and Ionescu all played 40 minutes against the Bulldogs. Oregon got two points, two rebounds, no assists and two fouls from its bench. Mississippi State got about the same from their bench as well. All the teams going forward will have deeper benches. Spring semester classes start this week. A few professors are going to get a note in their inbox today about kids missing this week’s classes. Syllabi will be sent to players in their university email. The digital age makes academics work in ways weren’t possible just a few years ago. Ionescu applied for and was accepted to Oregon’s School of Journalism graduate program. She is graduating after just three years. Unlike the men’s Final Four that is always played in a modified football stadium, this will be played in Amalie Arena. Amalie is about the same size as Moda Center, 20,000 seats or so. That’s good news for the Ducks, who’ll need to shoot well from three. Stadiums are notoriously tough on long-range shooters because the backgrounds behind the hoop are really deep, so depth perception can be difficult. We’ll have articles on the Ducks Final Four appearance all week.